Having a double jogging stroller is a staple if you have two children and still want to keep fit. It gives you the convenience of strapping your kids in and heading out with less hassle. Seriously, two children are a handful and finding time for yourself can seem like a nightmare. That’s why going through an overwhelming buying process should be the last thing on your mind. Today, we discuss the best double jogging strollers in 2018. We’ll be looking at the models that we have seen fit to appear in this list because they meet our expectations on the best designs and functional features. The design of a double jogging stroller explores one front wheel and two rear wheels. If the front wheel swivels when you are running, it may turn sharply which may result in dangerous tilting. To avoid this, ensure that the front wheel is lockable so that you can run in a straight line no matter the terrain. These are tires which can take the pressure from the jogging, weight of the babies, and the bumps in the road. You don’t want to be dealing with an unfixable plastic tire after going just a few meters. Your double jogging stroller should come with a suspension system so that your babies can feel comfortable even if you are running on off-road trails. Suspension absorbs the shock from the road so that the babies do not feel it. When you have two kids, whether they are twins or of different ages chances are that one of them may need a canopy while the other will not. At such times, you will not want to inconvenience one baby by having one canopy for the two seats. Again, the comfort of your baby is the most important. Ensure that the seat can recline to meet the needs of your baby. A reclining seat is more comfortable than a fixed seat when your children want to sleep. This way, they can take a nap as you proceed with your run. You may also need to look for a seat that can have an upright position if your baby likes watching and not sleeping as most kids do. A 5-point harness for each of your kids is highly recommended. This is because it keeps them stable and secure in the seat. Their body will not shift when you are taking sprints as it holds them in place in a comfortable position. Why we like it: Offers excellent comfort features for kids and simple to use for most parents. The BOB 2016 Revolution Flex Duallie comes with incredible features. First, it has high-impact wheels that are air-filled for covering all types of terrain. It offers the flexibility of using it on all roads so whether you love hiking or you can’t resist taking the longer route to the house, it will be perfect for your exact needs. With the adjustable suspension system, you can make changes according to the weight of your children giving them less bounce and a comfier ride. You will love it even more because of the tracking ability. For some roads, locking the wheel may not be enough. With this model, you can correct the alignment fast and easy with a twist of the knob. As you can already tell, this model probably has the most practical run-ability. It will be useful in not only keeping fit but even serious training. The adjustable handlebar is comfortable for all parents. It is also padded to ensure your hands will never be sweaty or risk losing your grip when speeding. Each of the seats can recline independently. It can also accept a car seat making it reliable during trips with an infant. It comes with a 50+UPF canopy to keep out the harmful rays. You will also like watching and interacting with your children via the peek-a-boo window. When it comes to storage, you have one bin with ample capacity for most baby items. This is a stroller which suits many applications. It is great for jogging with babies from the time they are eight months old, and it can take a car seat for strolling with an infant and an older kid. It suits all parents’ heights so everyone can take turns jogging with the kids. 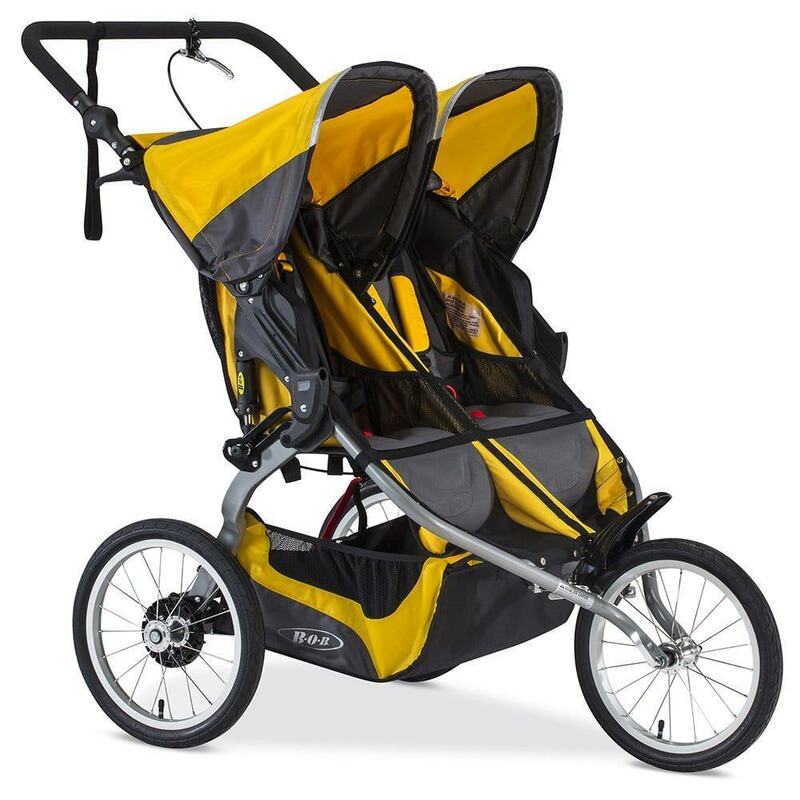 The first impression on the Baby Trend Expedition Double Jogger is the combination of bright outdoor colors with a tall design that can accommodate kids up to 42 inches tall (3ft 5 inches). It is a double stroller that has a sturdy build to carry kids up to 100pounds weight. That means it can comfortably accept 50 pounds on each seat. This is an all-terrain stroller that features rubber-pneumatic tires. It has excellent traction, and it rides like a bicycle. If the tires ever get punctured, you will not be left stranded since they are easy to fix. This stroller is lightweight, but it has ample space for two kids. It has a wide seating area and lots of leg room. Many parents like the maneuverability owing to the locking swivel front wheel. It resists wobbling even when you hit bumps; hence your running expeditions will always be comfortable for you and your children. We love that this stroller comes with a foot-activated rear brake. It ensures that you can quickly lock it without bending and even when with sandals. This way, if you decide to do some errands, you can leave it on the parking lot on a whim and be on your way without worrying it’s going to roll away. Baby Trend Expedition comes with a peek-a-boo window which also doubles as the ventilation window when it is fully open. You will be able to secure your kids using the 5-point harness, and they can sit comfortably on the reclining seats. Baby Trend has done an excellent job in creating a model that most parents will love and enjoy using. It has a smaller girth, rubber tires, and quality construction. Every day spent with your kids, will be all smiles with this dependable double jogging stroller. 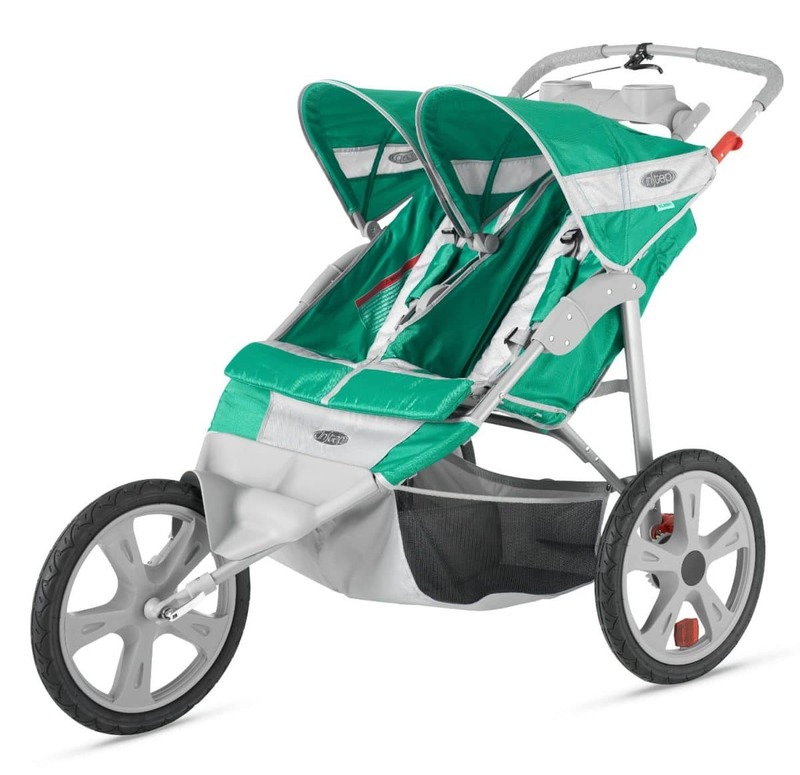 If you are looking for a double jogger at a lower price but with high-quality features, Baby Trend Navigator cuts it. It has two front wheels that are pneumatic and lockable. This gives you a smooth ride much as you would get with a bicycle. When you are out strolling the wheels give you better navigation around turns because of the trouble-free swivel. It will become a staple for running errands and having your kids enjoy being together in the same activity. Because of the four-wheeled design, you may not be able to take it on serious runs as it reduces the run-ability of the stroller. But it can take two infant car seats which makes it a good choice when you need to use it with infants or one infant and a toddler. This model is more cumbersome and wider which indicates it will be a bit of trouble going through doors and crowded places. Using the trigger, the stroller will fold up effortlessly, and it will not need using too much effort to lift it to the car. It also provides compact storage which is vital if you have little room for storage. You have a double jogger that includes both the child tray and the parent tray. You can take two drinks and two for each of the kids. It also carries one large bin at the bottom which can accommodate diapers and other small baby stuff. The basket has a capacity of only 5 pounds so you won’t be taking any of the large toys. This model is great for small-distance runs. It is highly maneuverable thanks to the four, air-filled tires. It has a modest capacity, and the construction is quite durable. The only problem we have is with the brakes because they are not sandal-friendly. Why we like it: This stroller boasts heavy-duty performance to tackle all types of roads and paths. It’s also great for older babies. This model expresses excellent usability from the time your kids are very young. It can accept a car seat for using it with an infant. Its unique features include an ergonomic handle which can adjust according to your height. It uses a swivel front wheel that locks into position when running. This model can easily maintain a straight line, and it will rarely require alignment on rough paths. You will love that this jogging stroller has rear suspension for an entirely smooth ride. Kids will love that they don’t keep bouncing especially on gravel. Your kids can sleep soundly on the thick and well-padded seats. The lightweight design offers this model lots of running capabilities. It is not the widest meaning you will not be hassling through crowded places. This stroller offers a one-handed folding mechanism. It is handy when you have to keep up with two kids and the stroller. It allows you to carry lots of stuff thanks to the large storage basket complemented by a water-resistant cover. It includes a magnetic peek-a-boo window to keep an eye on the kids. 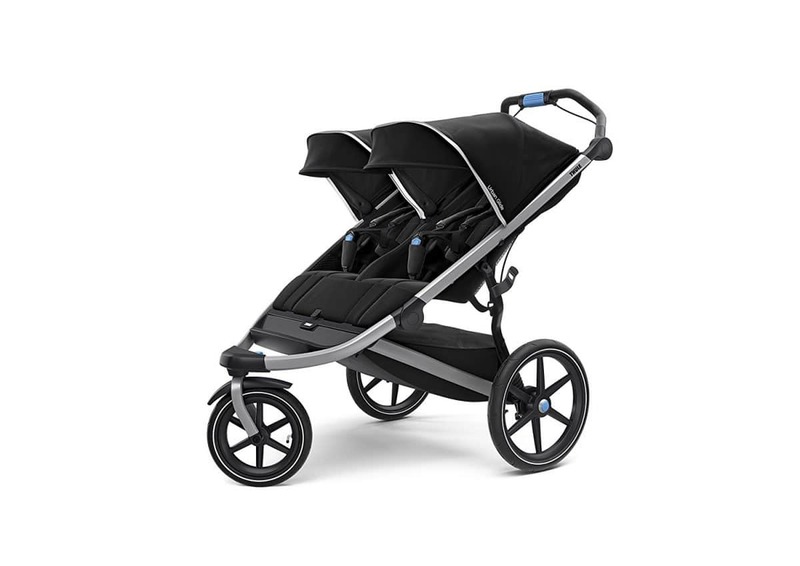 Thule Urban Glide combines maneuverability, simple usage, high-quality materials and an affordable price, all in one jogging stroller. It is going to be a favorite when taking daily walks and for jogging in areas where paths are rough and rugged. 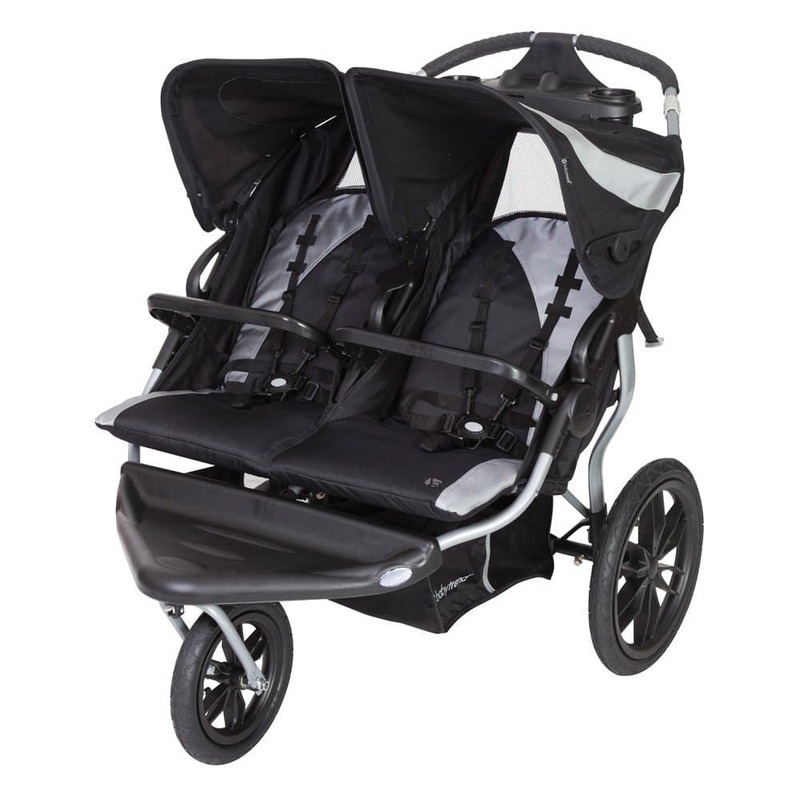 The Baby Jogger 2016 Summit X3 carries exceptional features. It falls under the leisure category as it is so flexible and dependable for daily use. The tires have a rubber construction. They are all air-filled to provide an effortless ride on all terrain. The front wheel is lockable from the handlebar so you can convert it from a stroller to a jogger in seconds. All the wheels have a suspension system to absorb shocks on uneven paths. You now have the chance to go to parks as well as on hiking trails away from home. We love that it uses hand operated rear drum brakes. This gives you more control on steep, downhill paths. The running ability is excellent. It’s not surprising because of the rubber tires and the locking capability. This stroller ensures that you will be able to keep fit since it will not slow you down or feel like it’s bulky to push. The swivel wheel provides remarkable navigation on smooth roads. You will not be stressing around corners. This jogger comes with large, adjustable canopies. They are independent, meaning you will attend to the individual needs of your babies. The seats recline to an almost flat position. If you are using this stroller during the first six months, you can place the twins in the most comfortable position. Remember to wait till your kids are old enough (6 months and above) to start jogging with this stroller. 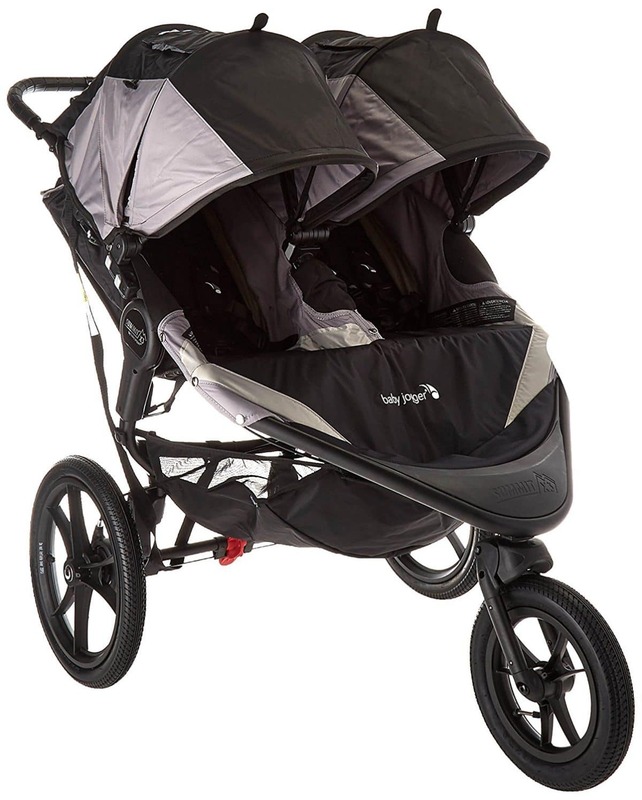 This jogging stroller is an ideal choice for running with two kids on board. It cannot accept an infant car seat, but the leg and headroom is wide for toddlers. The run-ability is over the top with the remote swivel lock mounted on the handlebar. You should expect this stroller to last in good condition for a decent time. Why we like it: It’s engineered for all parents to enjoy time with the kids on all adventures. 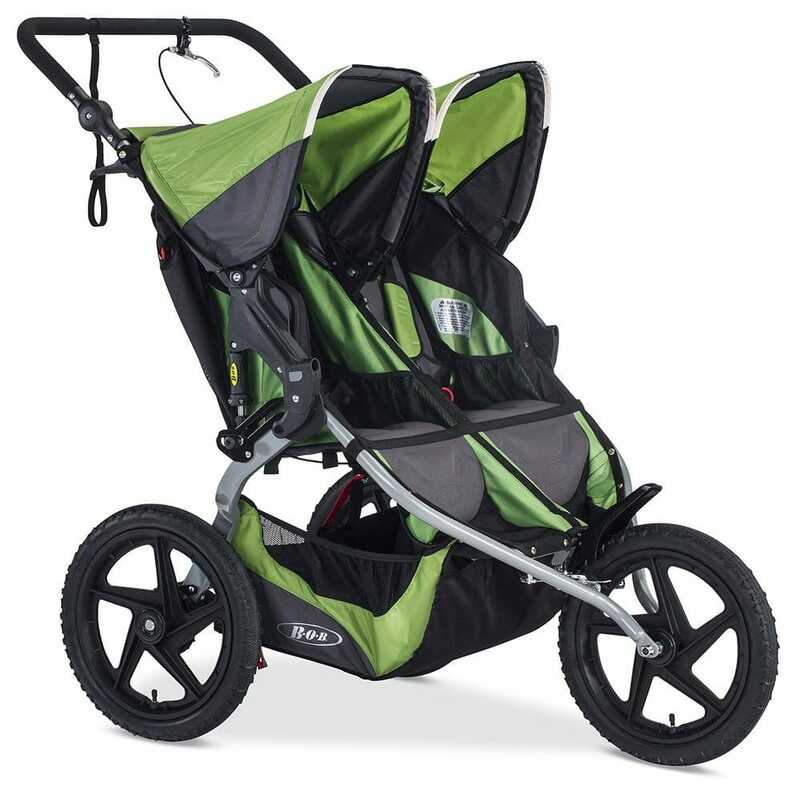 The BOB 2016 Revolution PRO Duallie is one of the most reliable double jogging strollers for on and off-road use. It comes with ergonomic handles which provide nine positions. It allows the hands to take the correct posture which in turn reduces fatigue when you are the tall parent. It is also an all-terrain stroller which uses air-filled polymer wheels. As the BOB brand, this stroller meets our expectations in terms of the run-ability and ease of use. It provides you with the popular adjustable suspension that lets you offer a smooth ride with kids of different weight. It also includes hand-activated rear brakes for controlled runs. It does not have a tracking system, but we suspect you will not need one as the front wheel locks tightly. The seats on this stroller explore an upright position to let kids take in the outdoors with you. The seats can recline to allow kids rest and feel comfortable when sleeping. This model is travel-ready as it can accept an infant car seat using an adapter and the bottom storage has a sizeable capacity. This double jogger has its best applications both on smooth pavements and rough roads. It boasts a durable construction with solid wheels and suspension. It has comfortable seats, and the canopies provide enough coverage throughout the day. The BOB 2016 Sport Utility features a fixed front wheel. It is a great option for running on hiking trails and in areas where the road gets rough. Most parents appreciate its stability on gravel and uneven grounds. Using the adjustable suspension system, it ensures that kids don’t have to feel every bump in the road. A fixed wheel provides no chance for shaking. It performs with excellence in the backcountry thanks to the 16-inch knobby air-filled tires. It brings durability in a model that can accommodate kids up to 50lbs on each seat. With the handbrake, you will always be in control along downhill tracks. This model enjoys a durable design from the robust metallic frame and fabric. It has an adjuster for front wheel tracking to ensure it will always run in a straight line. The Sporty Utility comes with independently adjustable reclining seats. Your kids can achieve the position they want, and they will feel supported by the cushy seats. Plus, you have the 5-point harnesses to secure them in their seats. You will also love the individual canopies that can be pulled all the way to protect your kids from the evening sun. This double jogging stroller is lovable every way you look at it. From the fully-upright seats to the integrated pockets, extra-wide storage basket, and the knobby tires, this model is ready to hit the road. Take it on adventure hikes because it will never disappoint. Why we like it: It is built for speed with a design that resembles a road bike. Speed trainers find it exceptional at run-ability. BOB 2016 Ironman Duallie is built for the serious runner. It comes with a fixed wheel which means it can run in a straight line just like a bicycle. It features 16-inch wheels that have aluminum spokes. This stroller remains lightweight to facilitate extensive training, endurance training, the triathlon, or even sprinting. It is a great companion when you need to bring the kids along on a long walk. This stroller comes with an adjustable handlebar making it flexible for everyone no matter their height. The suspension system provides two stages of weight support and 3 inches of travel. It affords the most comfortable ride no matter the state of the road. The fixed wheel is a thoughtful design that eliminates wobbling and the need to keep realigning the wheel. It allows you to run without stopping which makes it easy to time yourself when trying to achieve serious goals. The hand-activated brake comes in handy for controlled downhill runs. You will also appreciate the sizeable basket as it has a large capacity to accommodate lots of stuff. It provides one-handed recline adjustment so that you can quickly position the seat in a near flat position or an upright position for toddlers. The folding system follows a 2-step design that is effortless to release the wheels. The stroller folds compactly making it easy to store and transport. BOB 2016 Ironman is everything you want in a road runner and much more. It provides the convenience of being able to train with kids. It is a perfect for smooth roads with a few bumps but not hilly areas. Its performance remains incredibly useful, so you are up for some major training. Thule brings this stroller as an improved version of the Urban Glide. It has a better suspension, more compact folding, and a multi-position canopy but it is pricier and bulkier than the previous model. What you get is a slimmer stroller that can quickly get through doors. It also makes navigation in packed places much easier since you won’t be a distraction to others on the road. This stroller has excellent run-ability because of the slim profile. It will only feel bulky when lifting which will be after you fold it. Otherwise, this stroller is good to go on all terrains. You will like that it feels stable because of the metallic construction which goes to say it will be around for long without showing any signs of stress. The brakes are fast and easy to engage even with the sandals. The handbrake is centered on the handlebar, making it easy to twist when running downhill. This stroller provides excellent organization of baby items. It has a 10-pound storage capacity along with a waterproof cover. It also includes a rear storage which will come in handy for small gear. The seats also have pockets where you can keep toys and little goodies for the kids. There’s a retractable canopy which can reach as far as the knees so it can block out even the evening sun. This stroller has thoughtful features to make running more comfortable and the kids safer. They can sleep or sit upright, and you can run or walk without any hassle. It is an all-around item especially if you have kids that are close in age. While many double joggers only accept a single car seat, the Baby Trend Navigator Lite can accommodate two car seats from Baby Trend brand. It is an important feature when you have twin infants, and you’d like to use the same stroller when they get older for running. It will save you from buying another stroller after just a few months. This stroller is built to handle pressure from running. It has pneumatic bicycle tires with a locking front wheel. When you want to take walks, just unlock the front wheel remotely to improve maneuverability. It has impeccable running ability since the front wheel locks tightly to facilitate jogging. Like the other Baby Trend Joggers, it features a multi-reclining seat and a ratcheting shade canopy. It also comes with the parent tray where you can store two drinks. This stroller does not offer a tray for the kids, but it has a protective bar at the front. You will love the convenience of the quick folding mechanism that only takes seconds to collapse and store it. If you want to use your stroller to walk and later use it for running, Baby Trend Navigator gives you the exact features to suit your specific needs. You just have to ensure you are pairing it with Baby Trend Car seats. Otherwise, this jogger gives you outstanding navigation. Not every double stroller can work as a jogging stroller. It’s vital that you choose carefully so that you don’t end up with a model that disappoints you. Here, we’ll help you get the best stroller that is tailored to meet your specifications. A regular double stroller has small wheels and a more limited leg room which cannot accommodate your strides efficiently. However, a double jogging stroller will help you to run and not hit your legs against the frame. Not to mention, it has larger pneumatic wheels that are built for speed. Your stroller should be able to not only be useful for jogging but also help you carry out regular errands. If you need a stroller from the time your kids are in infancy, you’ll need to look for a stroller with the capability to accommodate infant car seats. The stroller should also be readily foldable with manageable weight so that you can lift it quickly into the car’s trunk or the house, while still holding your baby. Such needs will help you determine which stroller will work best for you. If you are having trouble installing a car seat, here’s how to go about it with the BOB Revolution Flex Duallie. Running with two babies means you will be trying to achieve the ultimate comfort and safety for both of them no matter their ages. You will be exposing them to stressful forces from bumps in the road to the pressure of jogging. The stroller will have to provide the best comfort and safetyto give them a memorable ride. First, your kids will have to be 6-8 months and older before you start using a jogger for running. If you are jogging with a baby who has just hit the 6-month mark, it vital to stick to smooth paths to eliminate any chances you could be putting them in danger. You will need to use a 5-point harness even with older kids. This secures them to the seat and eliminates any chances of sliding off the seat even if you are just taking a walk. You never know what bump lies ahead. Brakes are another critical safety feature. The stroller can have foot or hand-activated brakes to control the stroller on downhill paths. Brakes are also essential when parking the stroller. You might also need a strap for the hand or around the waist. A strap can also help control the stroller and keep it from rolling away when you accidentally let go of the handlebar. Here we are talking about the height and size of your baby. If you have a tall child and an infant, you should remember to check out a stroller that will not squash your older kid. It should provide wide sitting area and headroom. Also, look for a stroller with adequate suspension especially with a big kid so they will not be bounced on every bump. There’s no humor in hitting your foot against the frame of the stroller, bending too low, or reaching too high for the handlebar. Make sure your stroller is suited to your height, or it has adjustable handlebars. Ensure that your back is straight and your hands are in a comfortable position at all times. This eliminates any stress to the back especially if you are just from healing after a C-section. Taking baby items like diapers, wipes, sippy bottle, toys, etc. is a must when with kids. You will want the stroller to have enough room to hold enough baby gear for when you will be outdoors. Some strollers have small bins without protective sides; these are not a good pick for two kids. You can always get a double jogging stroller with closed sides to prevent stuff from spilling out. Closed compartments at the back of the stroller are also important for organizing small items like your phone and keys. Some other convenient pockets are those in the lining of the seat so that a sippy cup will be easily reachable for your kids. 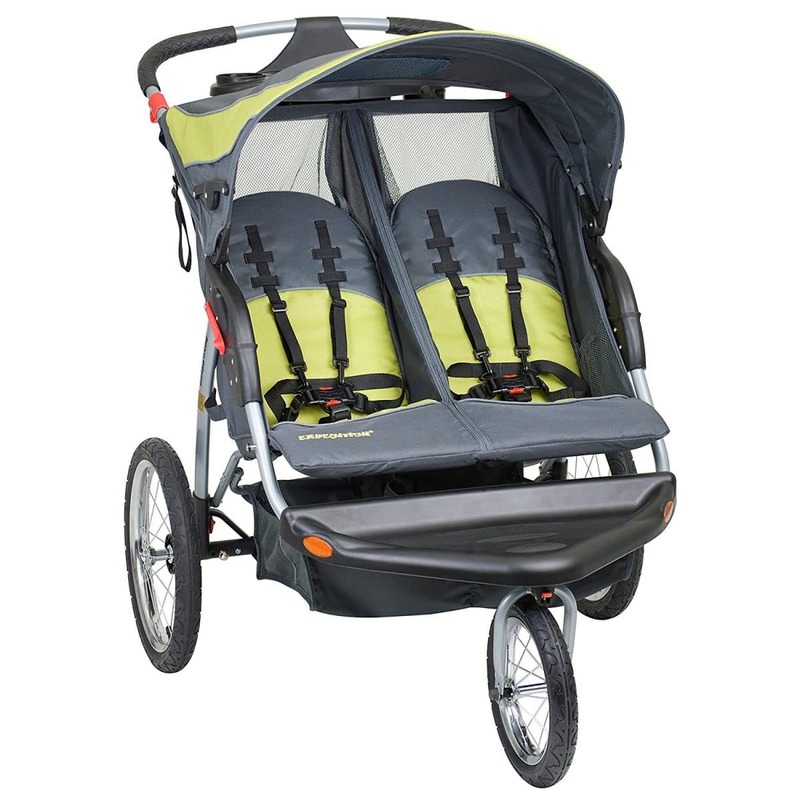 A double jogging stroller that has a folding mechanism is much easier to manage. You will encounter some models that use quick action systems while others use trigger mechanisms. Some will also allow folding the stroller with one hand. This way, you can use the other hand to hold your babies if you are using a double carrier. If you have limited storage, a stroller that folds compactly will allow removing the wheels and storing in a small footprint. 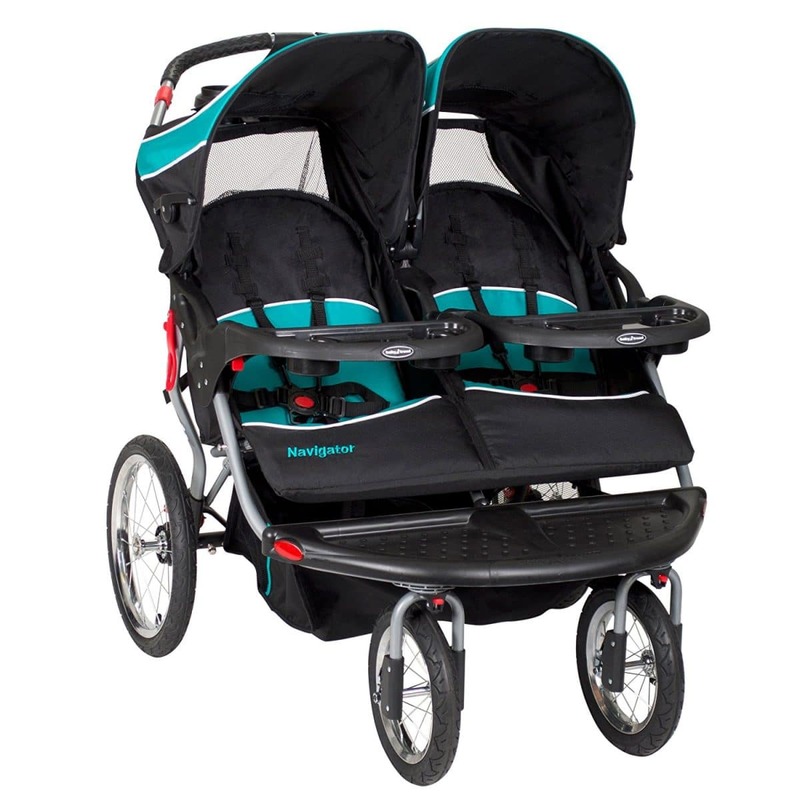 Double jogging strollers have either bumpy or smooth treads. Knobby wheels provide ample traction for riding on rugged and slippery roads. On the other hand, smooth wheels provide exceptional maneuverability in crowded places. 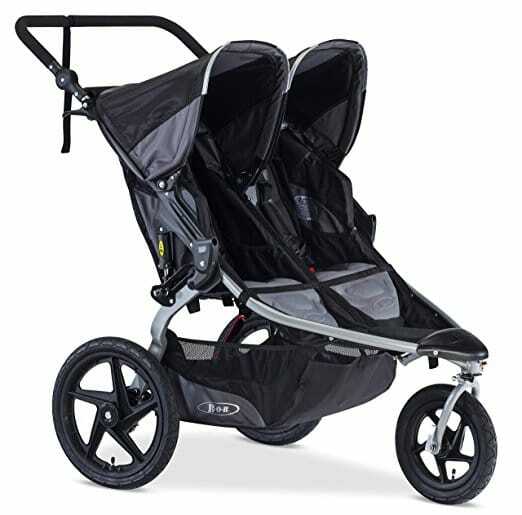 We believe by now you have essential tips to help you through the buying process of the best double jogging strollers. The brands on our list have been carefully evaluated to determine ideal features to suit most parents. You can be sure to find a double jogging stroller on a budget, for toddlers, infants, tall parents, and so much more.